Named for the abolitionist senator from Massachusetts, the Charles Sumner School was the flagship school of the segregated, African American school system. It was located on the site of an earlier freedmen's barracks school in an established, traditionally free black neighborhood where education had long been a primary concern. The Sumner School housed the first public high school for African American students. At its dedication, the chairman of the building committee called the Sumner School "a house that none need be ashamed to enter, and from which none shall be turned away while there is room to accommodate; be he white or black, high or low, rich or poor, if they seek for education they shall be welcome." More about Sumner School under ww.cr.nps.gov/nr/travel/wash/dc58.htm. 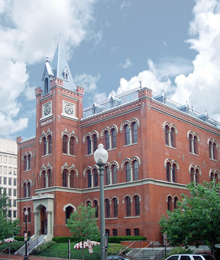 Today, and after a carful renovation in 1986, Sumner School houses the D.C. public school archives and a museum and is actually the location of the Washington Cluss Exhibition.